The 25th anniversary of the Minuteman Bikeway and the launch of Bikeway Haiku were held on September 29th. 10 miles, 110 haiku poems — written by the community. inspired by the nature and social life of the Bikeway, and stenciled on the path! There was music in three areas as Arlington celebrated Minuteman Bikeway Day, and a roving performance by Arlington’s Jazz Harpist Deborah Henson Conant pulled in a wagon by bike! Full schedule here. with fierce love, like yours. At the Haiku Hangout, our friends from Cambridge Typewriter Co., Inc. will have vintage typewriters for you to bang or peck out your own haiku. 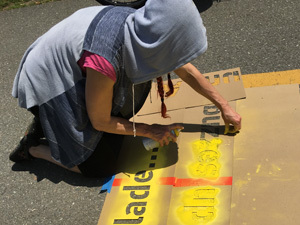 Find out more about the project, and get writing tips from some wonderful local poets who have helped make Bikeway Haiku happen: Jessie Brown Charles Coe Cathie Desjardins, Gloria Mindock. Meet project leaders Cecily Miller and Liz LaManche. Across the street, one of our sponsors Aeronaut Arlington will be serving up beer in Whittemore Park and rollicking live music. The Arlington Bicycle Advisory Committee will be there at a table to talk about all things bikes and bicycling with you. More live music will be in Spy Pond Park, where Christopher Frost will be putting final touches on a fantastical new work of public art; look for the man in a tree next to the Bikeway at the Linwood Street entrance! A third stage will be located near Trader Joe’s store on the Bikeway in Arlington Heights. Huge thanks to the folks who made Bikeway Haiku possible, including sponsors Aeronaut Arlington, Artist & Craftsman Supply – Cambridge, MA, and the Alt National Park Service, along with the incredible volunteer Bike Committees of Arlington, Lexington and Bedford who have been so generous with time and expertise. Thanks also to the wonderful Robbins Library and the libraries in Lexington and Bedford who joined with us to offer workshops and promote this opportunity to write poetry, and to the Munroe Center for the Arts for invaluable outreach in Lexington! AND THANKS TO MORE THAN ALL THE PEOPLE WHO CONTRIBUTED MORE THAN 460 HAIKU POEMS TO OUR PROJECT! An outpouring of creativity and love for the Bikeway and all its creatures. 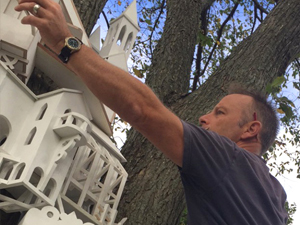 Christopher Frost’s sculpture Colony is a playful miniature village perched on a monumental tree near Linwood Street. Colony’s invisible inhabitants are overlooking busy Spy Pond Park and the Bikeway. ExtraOrdinary Birds is a set of art cards with portraits by painter Resa Blatman and text by Ellen Reed. These lush images of neighborhood birds, together with tips on how to spot and support them, are designed to spark your interest in birdwatching and stewardship. Look for the Northern Cardinal and Black-capped Chickadee in boxes on the chain link fence bordering the Bikeway between Linwood Street and Swan Place. PATHWAYS was started to bring public art to one of Arlington’s busiest public areas and enliven the town’s newly designated Cultural District, which stretches from Capitol Square to the Center. 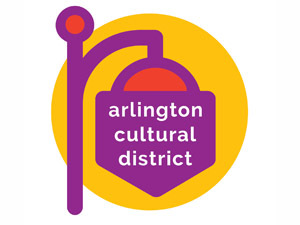 September 5, 2018, Arlington, MA – When the marketing committee of the Arlington Cultural District (ACD) sent out a Call for Ideas in June, they were hoping for a community brainstorm about art and events that would enliven the ACD, with a special emphasis on “The Gap” – the area between Capitol Square and Arlington Center. They were not disappointed. By July, eighty-seven responses had been received to the flyers and signs that had been posted along Mass Ave and in the business districts. What happens next? Carter emphasizes that while there is no direct funding for specific proposals, the submissions are being reviewed by the ACD Managing Partnership to determine if any ideas might fit in with existing efforts and which new ideas merit further consideration by the town. In the meantime, those interested in seeing the ideas submitted can view them at https://tinyurl.com/ybfbxh6f. As a reminder, the first Applicant Information meeting for ACC 2019 Grants is approaching on September 17th, 7-8:30pm at the Arlington Senior Center. An additional summary of ACC Grants dates can be found below. 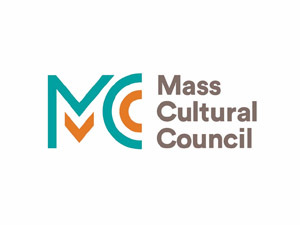 The Arlington Cultural Council (ACC), a program of the Massachusetts Cultural Council (MCC), announced the 2019 season of grantmaking on August 25th, 2018. ONLINE APPLICATIONS are available for projects occurring between January 1 and December 31, 2019. (Past) Sept. 17th 7-8:30pm Applicant Information meeting for ACC 2019 grants, Arlington Senior Center, 27 Maple St 1st floor Art room. To learn more about the ACC 2019 Grants, view press release here.